Probe and US Gold try to cram all the graphics, sound and gameplay from a 16-bit cart into a Master System cart. Did they manage it? Well we just have to wait and see. 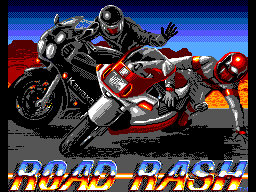 Road Rash is a well known motorbike racing game, which sees you racing for the top 3 positions. The higher your position at the end of each race, the more money you get. Use this to save for a better bike, which you will need soon because there are 5 levels each with 5 different tracks to race on. These get longer and longer as you win more races. To make this game fun, just ride up by a fellow racer and whack away at button 2 to throw a few punches and knock him off. Or try and find ways of getting some height by find things to jump off. Make a mistake and you go tumbling down the road and will then have to run back to your bike before carrying on. You'll need to watch out for the police too as they try to knock you off your bike and fine you, therefore you have to start that race again. And there's more, like the cars parked, driving through intersections or coming towards you so you have to watch which side of the road you ride on. You also need to watch out for things like signs, people, trees, posts, sand and oil and a load of other stuff that will bring you off your bike. The game plays great. All that fun in the Mega Drive version is here. 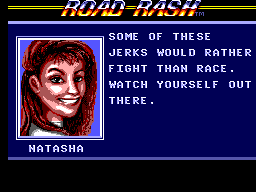 Well, nearly but what's missing is the other riders interaction of having a go at thumping you. They will do it but only occasionally. 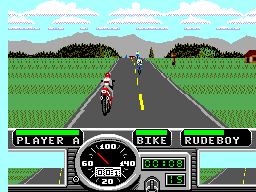 The screenshots show you riding up a hill as in the Mega Drive. Well the Master System version has all those lovely rolling hills and counrtyside to ride on and the effect is very good with nice use of colour and smooth animation too. The attract screens are as good as they could be. It's hard to fault it on the graphics. Well here's some more good news, the music is a good representaion of the original's music, minus a few sampled speech. If you don't like the music you can turn it off in the options. This game should have been in the arcades. It plays that well and with a good SMS pad, SMS Control Stick or even a Mega Drive controller/stick, you will have a good game as the controls are spot on. With different bikes to buy and a password save system, you know you can race one or sevral tracks, note down your code and the next time you play it you will have all your money, the bike, level and track that you were last on. The only problem is that it may get a bit repetitive after a long session. There is quite a challenge here to get through this game. It isn't hard but it takes a bit of time that's all. Although if you don't upgrade your bike, you will find the going tougher. The game isn't expensive nor is it rare but it is definitely a keeper game, so go out and find one now.